Today's card is totally CAS, and CASED! lol. I actually liked the look of this card, and pretty much cased it right out of the Close to my Heart catalog. The patterned papers are from last year's Christmas DCWV Mat Stack. I stamped on Kraft, with Tim Holtz Adirondack Lettuce Ink. The faux stitching was done with a white gel pen. All stamps are from Close to my Heart. Easy peasy! Thanks for stopping by - no time to bend your ears (lucky you!) today...have a meeting at the pet shelter, then a trip to Wal-Mart (ugh...) and hopefully a haircut! Have a great day - see you soon. Food for thought: It's not your position that makes you happy. It's your disposition. Goodness, seems like I'm always posting in a hurry. Remind me - exactly how did I do this before retirement??? It's overcast and a bit cool here, but not raining yet, which is a very good thing, as our fields are full of cut hay. We are praying for a few hours of dry around here. I have to make a road trip for DH, so this will be another short post. This little fall treat features one of the images from the Clear Dollar Stamps September release. Rather than make a card, I decided to make a 'tag' for a caramel apple. (Mmmmm....caramel apples...). I printed the image, used an exacto blade to trim the leaf and stem, and carefully folded the CS. Once I had it how I wanted it, I just trimmed it up and rounded the corners. they look like lots of white space! I think teachers might be tickled to receive something like this. Especially with one of those really fabulous high end candy apples! All coloring is with Copic markers, image from Clear Dollar Stamps, apple from Wal-Mart. Next up is a gift card holder that I made using a tutorial from Grace Nywening, that I found here. What a fun project this was, and Grace's tut was SO easy to follow! She has such a wonderful blog, full of yummy goodness - you really should check it out! I chose to use some of my new stamps from C.C. Designs on this card, and an older C.C. Designs sentiment from All That Scraps. All coloring done with Copics. CS is Bazzill Basics, DP is Prima Reflections. Stamps and Sunflower Die are from All That Scraps. Border Punch is Martha Stewart (punched border and cut in half lengthwise). Meet Hansel and Lulu. Aren't they just the ca-utest little people? Well, that's all I have for you today. I wish you a day full of happiness and blessings! I'm off to parts unknown with water samples!!! It it were not for 'last minute', I'd never get anything done! Happy Monday, everyone - hope the week is off to a wonderful beginning. It's a great day to be alive, right? You all know how there are times that you're not pleased with your creations, and times that you love them? Well today is a 'love them' kind of day! Today, I have a project for you that I created by enlarging one of the new fall release digi images from Clear Dollar Stamps, Sunshine & Smiles. ...and bound everything with my Zutter Binder, which I hardly ever remember to use! The last step was to tie some twine around the bottom, and use some ribbon scraps at the top. I think it turned out very nicely, and must find someone special to send it or give it to.... anyone out there need some cheering up? 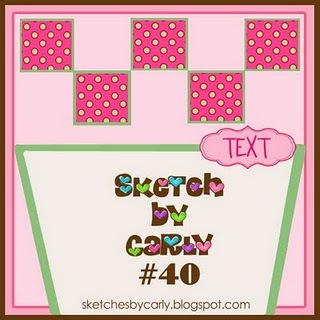 Next up, is a card made just for Sketches by Carly. When I saw this sketch, I was like....YIKES! What a tough sketch - great job Carly!!! I was totally stumped! and I thought, "hmmm, can't let a little old sketch beat me", so here's what I came up with. The image is a Sweet 'n Sassy digi. All coloring is with Copics, Snowflakes are punched with an old snowflake punch that has no name on it. Used some frosted Stickles on all of the upper DP dots, and on the snowflakes, snowman, and snow itself. The small sentiment is Hero Arts. Again, thought it turned out really cute! Thanks so much for stopping by - I'm off to see what YOU have been up to...saw lots of eye candy pop up in my reader a bit ago. Food for thought: Where you go hereafter depends a lot on what you go after here. Well, today really feels like a fall day. Very pleasant! I have a project to show you that was a lot of fun! This is for my September guest designer spot at Creative Cuts and More. Hope you enjoy it! CCM has oodles of die cuts, and if you don't see what you need, make contact with them, as they probably do have it! He who has no money is poor. But, he who has nothing but money, is poorer. No, wait - that's another story! THREE YEARS ago, I began my blogging adventures. It started out with DS, DD, and BF Tami reading. For many entries, I got anywhere from 0-2 comments each day. I actually started this blog to let the kids and our friends know how our bathroom remodeling was going. My friend Tami, and DD, both said, "you should start putting your paper crafts on your blog". Once I began posting cards, my very first 'real' reader was someone in the blogging world that is very 'famous' now - Theresa Momber, who designs for Gina K. Designs. Theresa is very busy these days, but I still feel that I can go to her anytime with questions, and she's always there. She encouraged me to enter my very first challenge, and I can still remember my hand shaking when I submitted to the first one! Feels rather silly now, but it was pretty frightening to jump in with both feet! The rest is history....blogging is something that I do for fun. I have been blessed with so many on-line friends! It's crazy, the deep friendships that I have built with some of you! I feel like I could land almost anyplace and find someone to crash with for a night, or craft with for a day. Some of you I actually have met in real life, and it's been delightful! Anyway, I guess I'm trying to just say thank you to all of you who have been such great readers and friends. I've enjoyed getting to know you, reading about your families, laughing with you, crying with you, and drooling over your beautiful creations!!! The winner of today's blog candy was chosen by "Random Wayne dot Org"! I'm home alone, so I called Shirley's DH and asked for one number between 1 and 41. His choice was 27. Comment #27 was left by Jerusha! Congratulations Jerusha! Drop me an email, and let me know where you would like to spend $26 shopping on-line! I have something a bit different to share with you today. About a month ago, I received an e-mail from Brendan with Easy Canvas Prints, asking me to review their product. I was excited about this, as I had seen another crafting friend's finished product, so I immediately said yes! Here's what happened. Brendan said the he would be happy to provide me with an 8 x 10 canvas made from my choice of photos. He provided me with my unique promo code, which allowed me to receive my 8 x 10 canvas print completely free. Even the shipping was included! The promo code also allowed additional upgrades, if I chose to pay for them. I did not make any upgrades, so my canvas was totally free. After issuing my promo code, I selected my canvas size and thickness. I then uploaded my photo. At this point, they tell me if my photo is good, fair, or poor. The next step was to choose a border option. After that, came color choice...sepia, touch ups, black and white, etc. I feel like I really tested this company with the photo that I sent. Our DD visits small towns, and takes photos while visiting. This photo, was DD actually taking a photo of an antique barber pole in a neighboring town. If you look closely, you can see the pole in the upper center of the canvas. Of course, you can also see a 'house of mirrors' type image of DD snapping the photo in the dome of the barber pole on the bottom of the photo. I chose to wrap DD's watermark around the bottom of the canvas, rather than for it to be visible on the front. As you can see, this was definitely not an easy photo to work with, and in my opinion, Easy Canvas did a remarkable job! This is an amazing canvas, and DD will be so thrilled to receive it for her new home! Easy Canvas has specials from time to time, and I hope to purchase from them in the near future. The entire process was very simple, very professional, and the end result is fabulous. I would be happy to review products for Easy Canvas at any time! If you need a gift for that special someone who has everything, consider Easy Canvas! You will not be disappointed! Have a great day, thanks for stopping by, and hurry back! Easy Canvas did compensate me with this 8 x 10 canvas print for writing this review. However, I would not endorse a product or service that I did not like, or that I would not use myself. The experience that I had with Easy Canvas was enjoyable, and I was delighted with the product that I received. Good morning, and I wish you the happiest of Wednesday's! I have a couple of Halloween cards for you today. The first card is total CAS! Susan R., (Susan, a.k.a. Late Blossom, has this incredible and amazing blog of ALL things CAS!!!) if you are reading, you simply HAVE to be proud of me! I ordered this Skull Spider stamp from Mark at Deadbeat Designs. If you've never checked out his stamps, you should. They are very unique, and you won't find designs just like his anyplace else. I also ordered another larger stamp that I can't talk about just yet, or 'someone' won't be surprised with her Christmas card. When I received my order, the box was full of teensy little puffy paper stars (Mark's a Texan), AND a free stamp! Mark had included the Mini Skeleton, as well, with a nice note to enjoy the free stamp. Service with a smile, a free stamp, and VERY speedy shipping - what more can a stamper ask for? I proceeded to grab up an old paper pack "Rockstar" from DCWV, found an eerie looking DP, mounted it on craft, distressed the edges a bit with some purple Tim Holtz ink, stamped the four skeletons and sentiment (an older TAC sentiment), and drew my line with a Tombow Marker. DONE! Not one single pearl, rhinestone (I was SO tempted), ribbon, or button! Yay, me! I did it! I'm entering this card in the "Less is More" Challenge. The gals are hoping to get 1000 entries for their 1000th challenge. They are close to halfway there! So, do you all remember the other day, when I said that I had worked for HOURS on a card that I gave up on because I hated it? Well, here it is.....and I still hate it! lol....Momma said there'd be days like this! For this card, I used a Close to My Heart Stamp of the Month, called Wicked. My bestest ever stamping friend, Shirley and I placed a combined order in August with a local CTMH lady, JUST to get and share this stamp. We do things like that often... if one of us buys a paper pad, or fun ribbon, the other gets their fair share!!! Anyway, I thought I'd sorta make a twist on an easel card. 1. You are almost out of time to sign up for blog candy! Look at my sidebar, up at the top, and go to THAT post and leave a comment. That's all you have to do! Some lucky reader will win a $26 gift card to the on-line store of their choosing. This will go up by $1 per new follower, so if you have friends that don't love me, tell them to drop by, leave a little love, and take a chance on winning! 3. Wednesday's rock - I wait all week for them, because our blogging friend Curt, posts on Wednesday's! If you have never visited his blog, you must. Too much fun, every Wednesday! Lots of fun, and lots of talent, all in one place! That's all for today - sorry I jabbered so much - both kids are traveling, DH is at work, my bestie stampin' friend has plans today, and even the dogs are asleep, so ha ha ha....you guys get my jibberish! Have a wonderful day - hugs and smiles to you all!!! Make the most of life before the most of life is gone. Hope that your weekend has been a good one! Ours has been wet and rainy. I want to thank all of you for the well wishes for the momma to-be last week. She went into the hospital on Monday, was induced on Tuesday, and finally on Wednesday evening, gave birth to a little stillborn daughter. Your thoughts, prayers, and well wishes were appreciated. I have a fun project for you today. This is the new Treat Dish Template from Doodle Pantry. When it is all folded up, it's an A-2 card. (comes in square size too!) When it's open, it's a sweet little tray for candy, or whatever..... I decided to use the Antique Slot image, and fill my tray with quarters! How much fun for someone heading out to Vegas! Hope it brings you a smile or two. Thanks for stopping by, can't wait to see what you make with your Treat Dish! Food for thought: Those who do things that count, never stop to count. Supplies Used: Authentique DP "Glowing", Doodle Pantry Image, 'Antique Slot', Bazzill Basics, Copic Markers, Scor-Tape, Doodle Pantry Treat Dish Template. I have a pretty short post for you today! I made a quick Halloween gift for a friend, using candy corn, ribbon from my stash, a scrap of DP, and some stamps. I colored the candy corn pieces with Tombow Markers. Ta-da! I'm going to enter this in the challenge at the I-O blog. The theme is "Is it fall yet"? lol...I only have one set of I-O fall stamps, so these folks are going to get real tired of seeing them! Thanks for stopping by! Hope you have a great day. My arm is being twisted to go shopping with a friend today. It's a tough job, but someone has to do it!!! The person with the smallest mind is usually the one who is most willing to give someone else a piece of it. New from Clear Dollar Stamps! As today is the 15th of the month, it's New Digi Release Day at Clear Dollar Stamps!!! I'm so excited for you to see the new digi's at Clear Dollar Stamps! And wait until you see the two new digi sets that Deedee Anderson designed... You will love them! Deedee will now be designing for Clear Dollar Stamps. My first card featurs the November Stamp of the Month, Chrysanthemum, designed by Vicki Conquest. The image was printed, colored with Copic markers, and fussy cut. The script was distressed with some Tim Holtz distress ink. The script was adhered to card front, and the image was popped up on dimensional squares. After it was all put together, I added some Glossy Accents to the image. Voila! Next up is a card made using the Birthday Fall Critters, designed by Laurie Wilson. I printed the DP, and cut in half diagonally. One half went on the card front, and the other half went on the card inside. The 'gift' was enlarged, and made into a card tag that opens for the front of the card. Hurry over to Clear Dollar Stamps to see what the other DT members have created - you will love what you see!!! Food for thought: There is no right way to do the wrong thing. Don't forget - there is still time to sign up HERE for my blog candy! You do not need to be a follower, but the gift certificate (to an on-line store of your choice) is up to $26 - and I will add another dollar to it for each new follower that signs up! You have 9 days left!!! I know that we still have a few days before fall officially begins, but I have to say that when I let the dogs out at about 5:30 this morning, there was a crispness in the air that felt both good and also a bit like, YIKES! Already? lol...We are never happy - when it's hot, we want cool. When it's cool, we want hot. Back to business. For my second project as guest designer for Creative Cuts and More, I chose one of their window cards that included a mat. I chose an orange card, with a brown mat. I wanted the card to be very visible, so decided on a very clean and simple look. Meet Pumpkin Birdie! I hope that this blog post ends up looking halfway okay. I'm still getting used to the new blogger format, and can't wrap my mind around seeing HTML codes where photos used to be! If anyone knows how I can have the new format, but actually see my links and photos while typing, I'd love to know!!! Thanks for being patient with me. Technology just keeps improving, and I'm trying to keep up! Food for Thought: Dieting is the penalty for exceeding the 'feed' limit. Wishing You Joy, and Blog Candy! Doodle Pantry September New Releases! Lots of photos....Grab your coffee!! !